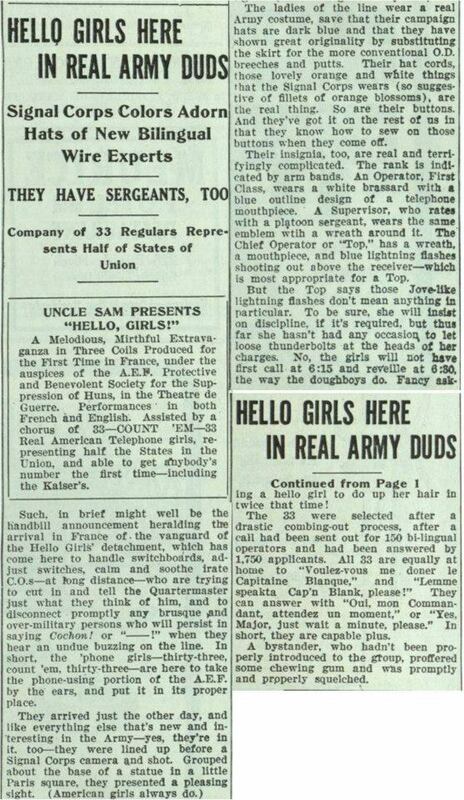 Last week I posted articles from the May 1918 issue of Bell Telephone News about the newly formed Army Signal Corps unit of telephone operators who would come to be known as the "Hello Girls." This wasn't the first that the company periodical discussed its war work, in fact this was the back cover in October of 1917. This points out that not all telephone work was done overseas. There was an enlargement of A.T. and T. facilities in Washington, D.C. Some women, who also were part of the U.S. Army Signal Corps, worked within the United States. They, too, were part of the 60 year effort to finally be recognized as veterans. The following year, this appeared in May 1918 before the adventure of the Michigan Hello Girls moved to Europe. These four Detroit women are not mentioned again. (Operators from Detroit, Hillsdale, and Marine City were the only Michigan Hello Girls.) By this article in May of 1918 fifty applicants, most without telephone experience, had been received. Is it any wonder few were accepted? Last week's operators were all from Chicago, Illinois or Madison, Wisconsin parts of the Bell System. Today's article was the most mentioned about Michigan women applying in 1918. Here's that official Signal Corps photograph of the 33 newly arrived telephone soldiers. 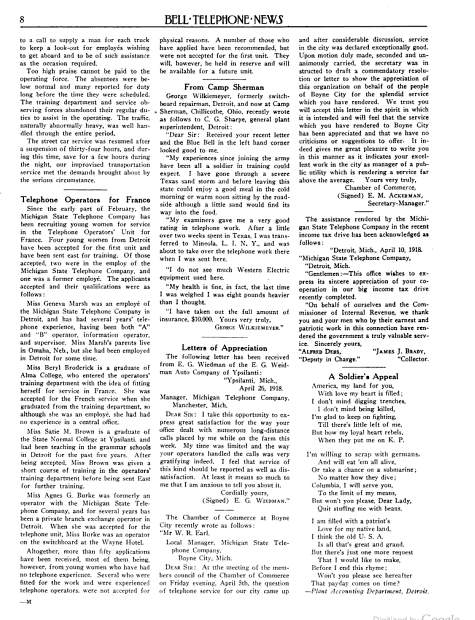 1919 contains the wrap-up of what, all the women agreed, was a great adventure for young women. 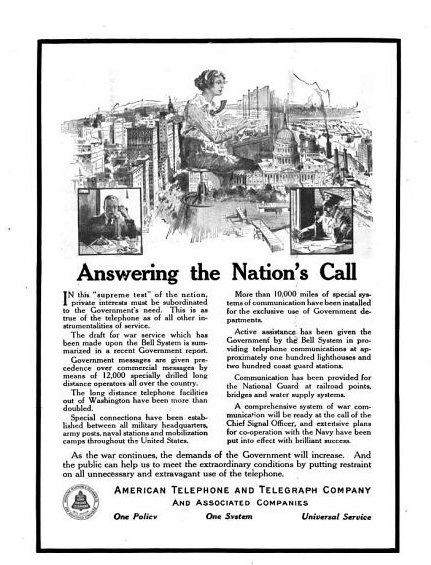 For 1917, 18 and 19 Bell Telephone News also gave a great deal of coverage to male employees who joined the American Expeditionary Forces, as the U.S. Army was called in World War 1, whether working for the Signal Corps to maintain telephone service or as regular soldiers. Please note reproduction quality is limited, but you may read free Google e-book versions of the Bell Telephone News as digitized from the University of Michigan Library.